Yesterday, I looked at the enormous wealth of U.S. billionaires and the growing gap between them and the rest of the American people. Today, I want to examine what’s happened in recent years at the bottom of the wealth pyramid. We know that, for decades, the share of net personal wealth owned by the bottom 90 percent has been declining. It peaked at 38.5 percent in the mid-1980s and, by 2014, it had fallen to 27 percent—more or less where it started in the early 1960s. 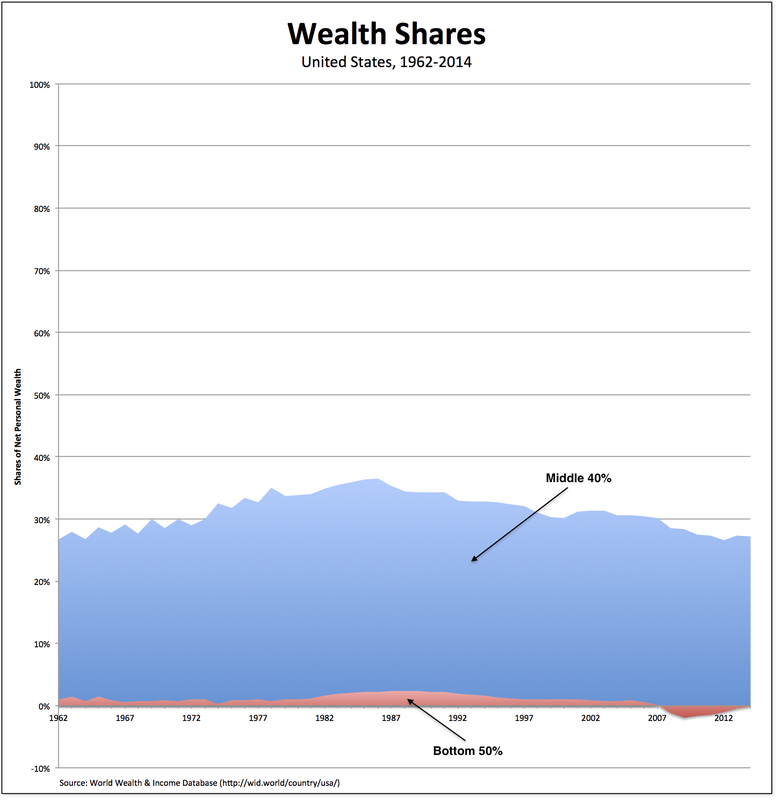 As is clear from the chart above, most of the change occurred for the middle 40 percent (the blue area), since the bottom 50 percent in the United States has owned very little personal wealth. Its share (the red area), which reached a peak in 1987 (2.4 percent), has since fallen below zero (-0.1 percent, in 2014). Clearly, the small and declining share of wealth owned by the vast majority of Americans challenges the fundamental presumptions and promises of the country and its economic institutions—that American workers should and would share in the nation’s growing wealth. They haven’t and, if current trends continue, they won’t. In fact, as it turns out, there is only one dimension of American society where wealth inequality is actually decreasing: the racial wealth gap among low-income households. And that’s only because, since the onset of the Second Great Depression, the median net worth of low-income whites has been cut by nearly half—while the median net worth of low-income blacks and Hispanics has remained relatively stable. According to an analysis conducted by the Pew Research Center of the data contained in the most recent Survey of Consumer Finances by the Board of Governors of the Federal Reserve System, there is a large gap between the median net worth of white families ($171 thousand) and both black ($17.6 thousand) and Hispanic ($20.7 thousand) families—a gap that increased between 2013 and 2016. The white-black gap grew from $132,800 to $153,500 while the white-Hispanic gap increased from $132,200 to $150,300. The gap between whites and both blacks and Hispanics also increased for middle-income Americans (those with incomes between two-thirds and twice the national median size-adjusted income). Thus, for example, white households in the middle-income tier had a median net worth of $154,400 in 2016, compared with $38,300 for middle-income blacks and $46,000 for middle-income Hispanics. But for low-income Americans (those with size-adjusted household incomes less than two-thirds the median), the racial gap, while still large, has shrunk considerably since 2007, the year the most recent crash began. 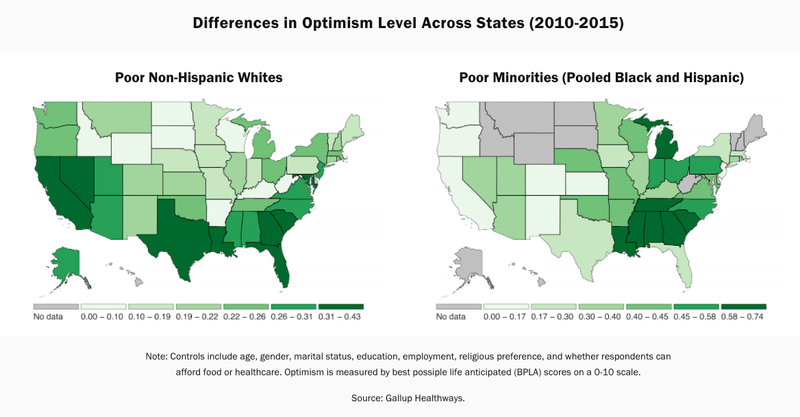 In that year, the white-black gap was 5 to 1 and the white-Hispanic gap almost 10 to 1. In 2016, those wealth gaps had fallen to less than 3 to 1 and 5 to 1, respectively. As is clear from the chart above, the major reason for the decline in the racial wealth gap is the fact that the median wealth of low-income whites fell by more than half between 2007 and 2013, while the median wealth of both blacks and Hispanics decreased by much less (around 19 percent). The cause of both the racial gaps and the decline in white wealth has to do with homeownership, the only major form of wealth held by low-income Americans. In 2007, 56 percent of low-income whites were homeowners, compared with 32 percent each for low-income blacks and Hispanics. The homeownership rate among low-income whites has trended downward since then, falling to 49 percent by 2016, but the rate for blacks and Hispanics is largely unchanged. The decline in low-income white wealth was caused by the crash of the housing market, leading to a fall in housing prices and a decline in the rate of homeownership. Economically, then, the crash and the uneven recovery moved low-income Americans—white, black, and Hispanic—much closer together at the bottom of the U.S. wealth pyramid. Politically, those changes created losses and resentments that affected the outcome of the presidential election of 2016, which in turn have made it difficult to challenge the conditions and consequences of the Second Gilded Age. No one ever accused American conservatives of being particularly original. They started with a story about the failure of government programs and they stick with it, against all evidence. Originally, conservatives targeted African Americans, who (so the story goes, e.g., in the Moynihan Report) were mired in a culture of poverty and increasingly dependent on government hand-outs. In order for blacks to regain America’s founding virtues (so the story continues)—especially marriage and industriousness—well-meaning but ultimately destructive government programs should be abolished so that they would once again be able to enjoy the security of marriage and dignity of work. The latest version of that story was penned by the American Enterprise Institute’s Arthur Brooks, who cites Lyndon Johnson’s War on Poverty as the original sin, which “deprived generations of Americans of their fundamental sense of dignity.” According to Brooks, “rural and exurban whites” have been left behind “every bit as much as the urban poor” because they’ve come to “depend on the state instead of creating value for themselves and others.” Real dignity, argues Brooks (echoing a long line of conservative thinkers), stems from people being “authentically, objectively necessary.” And that means working—or at least looking for work. That’s why Brooks cites the declining labor-force participation rate in the United States beginning with the War on Poverty. The first problem is, the participation rate has been declining since the mid-1950s, long before Johnson’s program was enacted. As readers can see in the chart at the top of the post, the labor-force participation rate for white men (the red line), which stood at 87.4 percent in 1955, had fallen to 84.2 percent by 1964 and then dropped to 76.6 percent in 2007 (on the eve of the latest crash). If we calculate the change by decades, it dropped by 3.2 percent points in the first decade and then by less then 2 percent points in each succeeding decade. It makes as much sense to blame the declining labor-force participation rate on Chuck Berry as the War on Poverty. But notice also that, from the mid-1950s onward, the labor-force participation rate of white women soared—beginning at 33.4 percent (in 1955), rising to 37.3 percent (in 1964), and peaking at 60.2 percent (in 2007). In the terms set forth by Brooks, that increase in dignity more than makes up for the falling rate for men. And much of the increase for women comes after the War on Poverty is enacted. Instead of mourning the fall in men’s participation, why isn’t the increase for women deemed a great success by Brooks and other conservatives? The only possible answer is American conservatives hold a nostalgia—an extremely selective nostalgia—for a particular moment in U.S. history. They envision a white working-class made up of men most of whom are forced to have the freedom to sell their ability to work outside the home, with wives who for the most part stay at home, care for their husbands, and raise future workers. At the same time, conservatives forget about the unions that made it possible for workers to earn a family wage—not to mention the Jim Crow laws and bracero programs that created barriers for black and Hispanic workers to compete for the jobs white working-class men were able to find. So, no, there never was a Garden of Eden—and, thus, no original sin. Before the new Republican administration has a chance to implement its campaign promises and dismantle the social safety net, it’s useful to remember who in fact is assisted by the existing programs. According to a new study by the Center for Budget and Policy Priorities, people of all races and ethnic groups who lack a bachelor’s degree receive significant help from the safety net. But white working-class adults stand out. Among working-age adults without a college degree, 6.2 million whites are lifted above the poverty line by the safety net — more than any other racial or ethnic group. In addition, the percentage of people who would otherwise be poor that safety net programs lift out of poverty is greater for white working-age adults without a college degree than for other adults without a college degree. But we also need to remember how brutal U.S. capitalism is, before government programs are taken into account. In particular, as can been seen in the table above, the poverty rate before taking income from government programs into account is more than three times higher among working-age adults without a college degree (30.4 percent) than among other adults (8.7 percent). And while poverty rates are lower for white adults without a college degree (24.3 percent) than for other adults without a degree (43.1 percent for Blacks and 36.2 percent for Hispanics), 1 in 4 white adults who lack a degree is poor before accounting for government benefits and tax credits. The fact is, government anti-poverty programs are so important—for white, Black, and Hispanic Americans—precisely because capitalism in the United States generates so much poverty among its workers, especially those without a college degree. We all know that the recovery since the Great Recession has been highly skewed. But has it hurt whites more than blacks and Hispanics, thereby explaining Donald Trump’s victory in the presidential election? That’s the story being told by Eduardo Porter (here and here), relying on data from the Economic Cycle Research Institute (pdf). Their basic argument is that, of the millions of net new jobs created since the pre-recession highwater mark of November 2007, most of them went to black and Hispanic (and Asian) workers, not to white workers (who make up the majority of the workforce). The numbers are correct—but their analysis is seriously incomplete. It comes as no surprise that those different job trajectories are reflected in the different trajectories of the employment-population ratio. Whereas the overall ratio and the ratio for whites have barely changed (at 59 and 60 percent, respectively) since the recession ended, the other ratios have in fact changed—rising for both Hispanics (from 59.3 to 62.2) and blacks (from 52.9 to 56.6). So, there are differences in job growth, a large part of which can be accounted for by different regional growth patterns (large cities vs. small towns and rural areas), sectoral shifts (services vs. industrial production), and demographic profiles (both the proportion of the working-age population and retirement rates). However, in every other way, the different groups within the American working-class have moved in tandem. For example, the labor-force-participation rate has declined over the past nine years—in general and for each subgroup, white, black, and Hispanic—and remains now just above record lows. Unemployment rates have also moved in the same direction—first rising dramatically after the crash and then falling during the recovery (but still remaining above what they were before the crash). Meanwhile, workers’ wages have barely budged—overall and for whites, blacks, and Hispanics—between the fourth quarter of 2007 and the third quarter of 2016. Porter is right in seeing support for Trump as being to a substantial extent a response to bad economic prospects. But the economic prospects of working class whites in the last decade were not notably worse than the prospects of working class blacks. And, I would add, all the other groups that make up the American working-class. The fact is, all members of the working-class—white, black, and Hispanic—have been victimized during the Second Great Depression. As I have shown elsewhere (e.g., here and here), as a class, they’ve fallen further and further behind the tiny group of employers and wealthy individuals at the top. That’s the real skewed nature of the economic recovery. As I see it, the difference in their political allegiances and voting patterns cannot then be explained by white workers losing out to black and Hispanic workers. It’s due, instead, to the fact that one group that has been left behind (working-class whites) threw in their lot with one candidate (right-wing, white-nationalist Trump)—while other members of the working-class (blacks and Hispanics), who have been equally left behind, simply could not. And, soon, all of them will discover Trump’s promises were no more than dog-whistle politics and his economic program will leave them even further behind. *The numbers don’t sum correctly (even without including Asian workers) because white Hispanics may be double-counted as both white and Hispanic, and black Hispanics may be double-counted as both black and Hispanic. What about the white working-class? In recent months, we’ve seen a veritable flood of articles, polls, and surveys about the characteristics, conditions, and concerns of white working-class voters—all with the premise that the white working-class is fundamentally different from the rest of non-working-class, non-white Americans. Hence the curiosity—best exemplified by a new CNN/Kaiser Family Foundation [ht: ja] poll, about what white working-class Americans think. The results of the poll are interesting, if only because on many issues (aside from support for or opposition to Trump and immigration) the white working-class holds views that are not all that different from other whites, blacks, and Hispanics. The fundamental problem with CNN/Kaiser poll (as with so many others) is its basic definition of the working-class: “those who have attained less than a four-year college degree, excluding those between the ages of 18-24 who are currently enrolled in school.” As I have argued before (e.g., here and here), that’s not the working-class. It’s just people who never went to or didn’t finish college. What they’re using is a definition of the working-class that doesn’t include all those other people, many of whom have college degrees, who are forced to have the freedom to work for someone else in order to make enough money to support themselves and their families. Together, most Americans with and without college degrees work for the boards of directors of large corporations—and they don’t manage the production process or supervise other employees. Workers show up for work every day knowing that they have little job security; they are paid what employers feel is consistent with their main priority, which is making profits, not the well-being of employees; they work at a pace and duration that is set by their bosses; and they submit to these conditions, not because they want to, but because for most of them, the alternative to accepting these conditions is not having a job at all. The working-class, as I am defining it then, turns out to comprise the vast majority (70-80 percent) of the U.S. population. And most of them, of course, are white. So, what does the CNN/Kaiser pool reveal about the views of, to be clear, one portion of the white working-class? As I wrote above, on many issues, they’re not all that different from other whites or blacks and Hispanics without college degrees. In terms of their own lives, most of the so-called white working-class, as the other poll respondents, are not angry, worried, pessimistic, or unhappy. But they are dissatisfied with the country’s economic situation and with the influence on the political process of people like them. In recent years, they report it’s become harder for them to get ahead financially and to find good jobs. Finally, they blame the federal government much more than their employers or Wall Street for the economic problems facing the working-class and they believe the federal government helps wealthy people too much and members of the working-class too little. That’s exactly the set of answers one would expect from the American working-class—white, black, and Hispanic, with and without college degrees—right now. They’re getting screwed and, while they may not be dissatisfied in their own lives, they certainly think both the economic and political systems are stacked against them. Perhaps the only surprising item in the survey is the extent to which they blame the government, and not their employers or Wall Street, for the economic problems facing the working-class. In the end, those two differences—on Trump and immigration—are what make the so-called white working-class interesting to the media. It’s not their conditions or their grievances, much of which they share with other members of the working-class. It’s only the fact that they threaten to vote for the renegade presidential candidate and they’re wary about the role played by other, immigrant members of the working-class. And, of course, many of them are thrown into the “basket of deplorables” by the opposing campaign. Both presidential candidates, then, are sowing and exploiting those differences to their own advantage, which is what U.S. politicians have always attempted to do when it comes to real or imagined divisions within the working-class. That’s how they campaign and that’s how they hope to get elected. Trump and Hillary Clinton (and their echoes in the mainstream media) have created the “white working-class” and they hope to ride it—as a source of support or a specter—to victory in November. And then, whoever wins, they’ll abandon it—along with the rest of the working-class. *Actually, Bernie Sanders also played an important role in focusing attention on the white working-class, especially with his stunning primary victories in Michigan and West Virginia. Since his loss to Hillary Clinton, however, the white working-class (along with the rest of the American working-class) has virtually disappeared from Democratic discourse. ***There is one additional difference that requires mention: while a majority of whites—with (62 percent) and without (69 percent) college degrees—believe trade agreements cost the United States jobs, a much smaller percentage of blacks and Hispanics without college degrees (both 37 percent) think that’s the case. Toward the end of the Civil War, former black slaves were ordered to receive “40 acres and a mule.”* Then, a few months later, Andrew Johnson overturned General Sherman’s Order and most of the United States’ 3.9 million former slaves never received any of the promised wealth. Over the past three decades, the average wealth of white families has grown by 84 percent, three times as fast as the rate for African-American families and 1.2 times the growth rate for Latino families. In dollar terms, if the past 30 years were to repeat, whites would see their wealth increase by about $18,000 a year on average, while Latino household wealth would increase an average $2,250 a year and wealth for African-Americans would grow by just $750 annually. But the problem of wealth is not just a matter of ethnicity or race. Between 1983 and 2013, the top 20 percent of the wealthiest households took 99.4 percent of all wealth gains, with the top 1 percent taking the lion’s share of those gains (40 percent). Meanwhile, the bottom 80 percent of households—white, black, hispanic, and so on—were left with just 0.6 percent of total wealth gain. the billionaires of the Forbes 400—which includes only two African-Americans and five Latinos—now own more wealth than the entire Black population and one-third of the Latino population, combined. That’s 400 wealthy individuals versus more than 60 million people. The fact is, wealth-building policies in the United States have long favored the wealthy over typical wage earners, and many of the largest and most powerful of these programs flow through the U.S. tax code. An overwhelming amount of the spending done through the tax code goes to white households at every income level but especially for those (who themselves are overwhelmingly white) at the very top. Perhaps it’s time then for a new redistributive Order, the contemporary equivalent of 40 acres and a mule for all working-class households in the United States. *And it’s a conservative estimate, since the analysis is based on average, not median, levels of wealth.